Since starting the keto diet, you probably found yourself meal prepping more than in the past. After a few weeks, you could easily be at a loss for dinner ideas. Here’s a meal prep hack: Select a few fundamental recipes, then swap out a few core ingredients to create a “new” recipe with minimal effort. For example, if you pack the same salad for lunch each day, rotate between two or three salad dressing to keep your meals fresh and exciting. The same tactic can be applied for the dish listed below. With just five core ingredients and four steps to follow, this easy meatball recipe could become a weekly staple in your keto meal plan. Simply double the ingredients, then choose two or three sauces to round out your weekly meal prep. Below, you’ll learn how to make traditional meatballs keto-friendly and how to prepare this recipe five different ways. 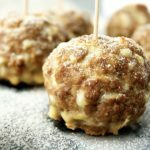 Most traditional meatball recipes combine some sort of ground meat (ground turkey, ground beef, or Italian sausage) with bread crumbs, eggs, fresh parsley, and Italian seasoning. To make any meatball recipe keto, simply swap out the bread crumbs for a low carb alternative. Typically, a gluten-free flour with a grainy texture works best, such as almond flour or almond meal. This one swap results in a low carb meatball recipe packed with 12 grams of protein, 10 grams of fat, and less than one gram of net carbs into a single serving. The recipe below doesn’t require any fancy equipment. All you need is a large bowl to assemble your meat mixture and a baking sheet. If you prefer meatballs with a bit more texture, consider searing them in a cast iron skillet over medium heat, then transferring the entire skillet to a preheated oven. Have you ever heard the saying, “Cook once; eat twice”? That’s exactly what you’ll do with the recipe listed below. With just one meatball recipe, you can enjoy five different meals. By preparing a variety of sauces like the ones listed below, you can enjoy different flavors each weeknight, all with minimal effort. Asian-style meatballs: By tossing your meatballs in this garlic sesame keto dressing, you can have a deliciously tangy, Asian-fusion dinner. Pair with steamed bok choy or an Asian-style slaw. Alfredo and cheese meatballs: This keto-friendly, cheesy alfredo sauce blends cauliflower florets with mozzarella cheese, garlic powder, cream cheese, and heavy cream for a rich, thick sauce. Serve alongside almond flour mozzarella sticks for a complete Italian meal. Pizza meatballs: Everyone serves meatballs with marinara sauce — why not switch things up a bit? Toss your meatballs in this keto-approved pizza sauce and sprinkle with parmesan cheese for a new twist on classic Italian meatballs. BBQ meatballs: Most store-bought brands of barbecue sauce are filled with added sugar. This keto version is made from tomato sauce, apple cider vinegar, liquid smoke, and monk fruit, resulting in smoky ‘n’ sweet barbecue meatballs. Buffalo meatballs: To make buffalo-style meatballs, all you need to do is toss your baked meatballs in buffalo sauce (Perfect Keto recommends Frank’s brand). For a party-friendly appetizer, serve with toothpicks and dip in this keto ranch dressing. The main ingredient in these keto meatballs is grass-fed beef. Why is it important to choose grass-fed beef over grain-fed beef? Here are two ways grass-fed beef supports your health. Grass-fed beef contains CLA (conjugated linoleic acids), a fatty acid present in meat and dairy products. Recent studies praise CLA for its various health benefits, including its ability to fight cancer, prevent tumor growth, and support healthy weight loss[*][*]. According to the National Public Health Institute in Finland, CLA blocked the growth of cancer in human studies. Another study showed CLA prevented the onset of breast cancer in women[*]. Studies also show CLA helps support healthy blood sugar levels. In a study researching the effect of healthy fats on insulin levels, CLA improved insulin sensitivity[*]. Vitamin A: Vitamin A is essential for the health of your vision, reproduction, and immune system. Vitamin E: Vitamin E acts as an antioxidant in your body, preventing free radicals, boosting the immune system, and preventing blood clots[*]. Glutathione: Glutathione helps build and repair muscle tissue, make proteins in the body, and support the immune system[*]. Superoxide dismutase: This enzyme breaks down potentially harmful molecules in cells, preventing damage to tissues[*]. With a little patience and a lot of planning, meal prep on the ketogenic diet doesn’t have to be complicated. Stick to quick keto recipes you can prepare any night of the week. To make things even easier on yourself, swap out a few ingredients to make one fundamental recipe taste like two completely different meals. This recipe can be prepared five different ways, making them the best meatballs for your weekly meal prep. Plus, with less than a gram of carbohydrates per meatball, you’ll easily keep your daily carb count low. For more meal prep hacks, check out the Perfect Keto Essential Guide to Effortless Meal Prep. Take it back to basics with these keto meatballs. They’re the perfect addition to your meal whether you’re making them for yourself or hosting a dinner party! In a mixing bowl, using hands, combine all ingredients and knead together until well-incorporated. Form mixture into equal-sized meatballs and place on prepared baking sheet. 015: Tony Wrighton – Biohacking For a Happier and Healthier LifeKombucha on Keto: Is It a Good Idea or Should It Be Avoided? Simple keto meatballs. We loved them very tasty. Would make a great meatloaf. Had with salad. Very easy to make. Very good. Served over keto creamed spinach. Delicious. Just made these for the first time. Really good and very moist! I cooked in convection oven. Thanks – this goes into my meal prep rotation immediately! Thought you implied this should have swapped out the bread crumbs for almond flour yet I don’t see any almond flour on the list of ingredients. Or is this recipe correct as printed above? Hi Ann, the recipe doesn’t require almond flour. The one mentioned above is for traditional meatball recipes where some use bread crumbs and the best alternative for it is almond flour. Love these. Super easy to make and taste great. So good! Tossed in Franks Red Hot sauce and dipped in blue cheese dressing. Served with broccoli for a perfect easy meal- yum! Was agonizing over several recipes. Sometimes I don’t care for almond flour substitue recipes, but I kept thinking it made sense to replace the breadcrumbs. I have also made meatballs that end up greasy, or and odd texture, when NOT dieting, so had worries. I saw a few recipes with heavy whipping cream, of course that sounded tasty, but maybe juicy. Finally settled on these. PERFECT! I made 2 lbs., warmed half with marinara and served with steamed broccoli. For sure a new go-to!